Weiβ Schwarz Cards of the Day: 4th of March | TCG, shiyo? 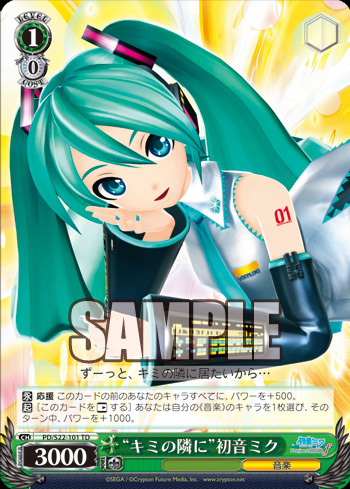 We’re into our second week of Project Diva previews, and we’re starting to get a better look at the cards from the booster back. 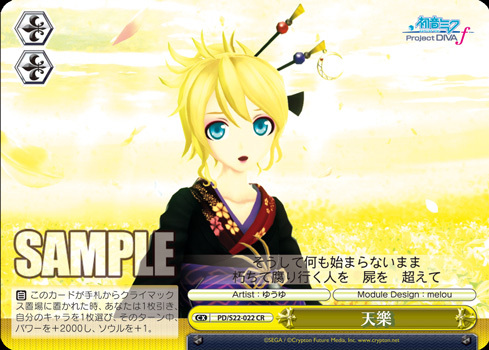 Today we’ve got a support Miku from the TD alongside a Rin Climax combo from the booster pack. [CONT] ASSIST All of your characters in front of this card gain Power +500. 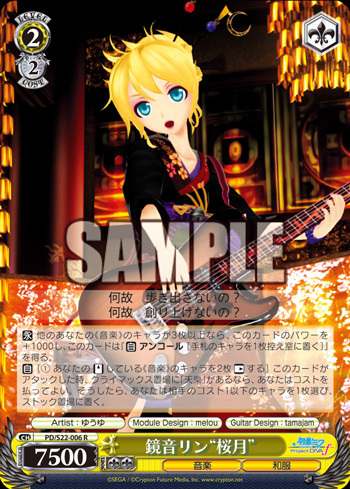 [ACT] [Rest this card] Choose one of your «音楽 Music» characters, during that turn, it gains Power +1000. Our first card today is a Level 1 Miku support card, who has an advantage over basic Assist cards, but is of course a Level higher than most of them. Her first effect is standard basic Assist, but you usually find this attached to 0/0s rather than 1/0s. It’s only her second effect that sets her apart from Level 0 supports though, since it essentially allows you to get an extra 1000 power for free. The issue with this card is that it’s probably not worth running it alongside Level 0 support cards, because otherwise you’ll need to replace them very quickly, wasting your cards. If you forgo Level 0 supports, it might leave you lacking in power during the opening of the game. [CONT] If you have 3 or more other «音楽 Music» characters on your Stage, this card gains Power +1000 and [[AUTO] ENCORE [Put 1 character card from your Hand to the Waiting Room]]. [AUTO][(1) Rest 2 of your Standing «音楽 Music» characters] When this card attacks, if [Tengaku] is in your Climax Zone, you may pay the Cost. If you do so, choose one of your opponent’s Cost 1 or below characters and put it to Stock. [AUTO] When this card is placed in the Climax Zone from your Hand, draw 1 card, then select 1 of your characters, during that turn it gains Power +2000 and Soul +1. Our first Rin Climax combo is quite useful for getting rid of your opponent’s annoying cards, as well as having quite high survivability herself. Her first effect allows her to become an 8500 with Encore when you have 3 or more other «音楽 Music» characters. This will usually mean your two Back Stage cards plus one other card will be enough to fulfil this condition. Whilst Rin might be lacking in power compared to other Cost 2s, this will be made up for by the fact she has Encore and her Climax combo. Due to Encore it should be easier to pull off the combo, because she can stay on the Stage for longer. The Climax combo allows you to send an opponent’s Cost 1 or below characters to Stock, allowing you to clear out most annoying support cards in the game. This includes annoying cards like the Encore supports from Disgaea and Angel Beats! and the anti-heal card from Rewrite. Since the effect requires you to Rest two characters to play it, it means you wouldn’t be able to use the effect alongside cards like today’s Miku, since you’ll usually be Resting both Back Stage cards. The fact the card goes to Stock is a double edged sword, because on one hand your opponent cannot Encore the character, on the other they’ll have more resources to play cards next turn. The climax replaces itself helps you gain a lot of advantage from this combo, because it replaces itself whilst providing a power boost. The latter means that the combo will gain you one card over the opponent, whilst the latter should help you win a battle and gain even further advantage over your opponent.